Well after three days of nine-hour volunteering, I will take the time to put together some up-to-date information on how the reusing experiment is going. I wanted to make blocks of bottles in order to easily lay them together, assemble, and store. 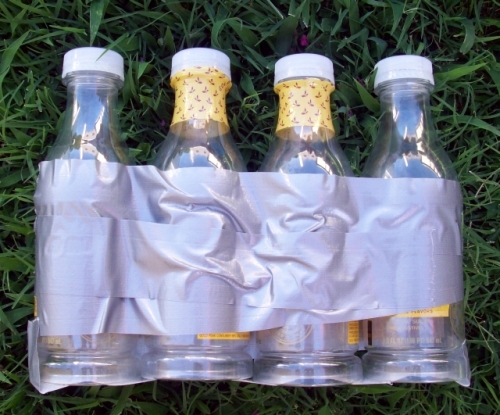 Since I am a college student and I do not have the foresight to know how duct tape will work, I automatically assume it will hold together anything I use it on, so why stop myself now? The above picture is a pile of all the blocks I put together. Similar size bottles were grouped together, organized, and then tightly taped. Well today I found out duct tape slacks up a bit, so I might have to do a bit more research and taping. The plan this weekend is to make quite a few more blocks and test some layouts. Twice as many blocks are probably going to be needed ASAP, so I will probably be seen biking around town acting as one of those angry environmentalists. You know what? I'll just wear an oversized tree-shirt (get it?) and munch granola bars. There has got to be a better, yet cheap, alternative to duct tape. Time for a smoke and a thought. Seacrest, out. 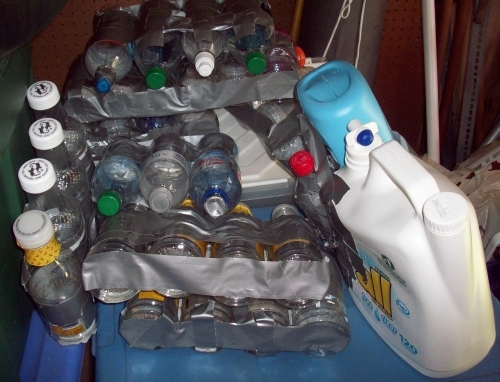 This entry was posted on October 4, 2009 at 12:14 pm, and is filed under DiY, recycle . Follow any responses to this post through RSS. You can leave a response, or trackback from your own site. Duct Tape is the universal glue of the world, man. It is made of Nintendonium and Neverfail. Duct tape is good but will be expensive in the long run. 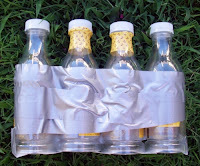 Try using cheap netting and instead of making blocks, make large tubes or sausages of empty bottles, and lash them together, it doesn't have to look pretty to work. Buy fishing nets or bird netting. 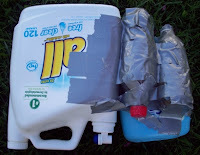 To plug up the bottles I guess you could use a can of expanding foam!